When Han Han blogs, a million Chinese netizens click and read. The popular Chinese blogger, race car driver and literary star has just released a collection of English-language translations of his essays that criticize both Chinese Communist Party policies as well as Chinese society at large. Not so long ago, many Chinese commentators wrote in a cautious, oblique style designed not to offend the nation's famously humorless leaders — then came the Internet, blogs and a cheeky young man named Han Han. The voice of China's post-'80s generation, Han is ironic, skeptical and blunt — writing what many young Chinese think but dare not say publicly. Now 30 years old, Han has boy-band good looks, drives race cars and has 8 million followers on the Chinese equivalent of Twitter. A collection of his satiric essays is out this month for the first time in English. It's called This Generation: Dispatches From China's Most Popular Literary Star (and Race Car Driver). -- "I participated in quite a few essay competitions. Before each event, I had to first brainwash myself and check to see what slogans were in fashion." -- "We learned that the first article of the Constitution is: 'If we say you're guilty, you're guilty.' "
-- "The main contradiction in China today is between the growing intelligence of the population and rapidly waning morality of our officials." 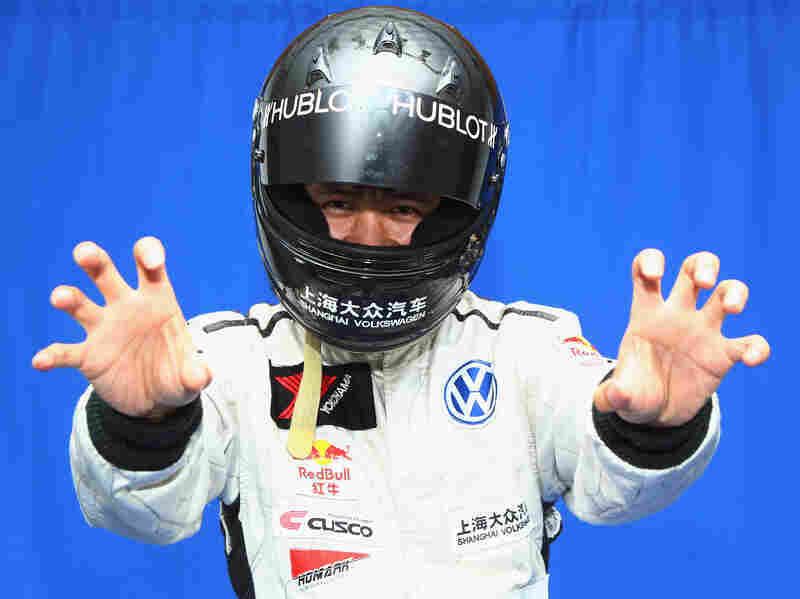 Blogger and race car driver Han Han doesn't shy away from skewering Chinese government and society. Han says he hopes his writings will encourage some of those officials to change China's system. "I hope intellectuals and the public can put more pressure on them, pushing them to reform," Han says. "They will only reform when there is pressure. If they are quite comfortable without feeling any pressure and making easy money, why reform?" Han says he developed his pointed style of writing after years of suffering through dreadful prose in China's public schools, "terrified," he says, by articles that were unreadable and boring. As a young student, Han first took aim at the nearest authority figure. "At that time, I would write articles about my dissatisfaction, including what's bad about the school and the teachers," Han says. "But the silliest thing I did was I handed the articles to my teachers, who felt very unhappy after reading them, saying you can't write this way." Later, in the freer era of the Internet, he could, and did, become a star. Eric Abrahamsen, who runs the Chinese literary consulting and publishing company Paper Republic in Beijing, likens Han to another generation that challenged the status-quo. "If we're talking about America in particular, you'd have to go back to the counterculture era of the '60s because that is what's really happening in China now," Abrahamsen says. "You have a younger generation that's rising up against a more conservative, more staid, more restricted, older generation in trying to throw off that yoke of authority. You'd have to go back to Bob Dylan or J.D. Salinger." Abrahamsen is quick to note that Han is not in the same league with those icons, but does capture the dissatisfactions of many Chinese youths. If Han is a generational symbol, he doesn't seem like it in person. He works out of a sparsely furnished apartment in a residential tower in a down-market part of Shanghai. Sitting on a beat-up couch next to a bookshelf littered with empty Coke cans and old, foreign magazines in his office, Han is polite, engaging and soft-spoken. In the last year, though, Han has come under fire for supporting the slow, evolutionary change of China's authoritarian system, instead of democracy. "If you are against the system and are to overthrow it, of course it's a good thing, but sometimes you may pay a high price for that," Han says. "The system can be turned into a mere figurehead. Under these circumstances, you are probably paying the lowest price. And as you change and everyone changes, the system will probably change as well." This sort of talk disappoints Andrea Liu, a 27-year-old who works in the Shanghai financial industry and one-time Han fan. "Now, his stuff feels like it's written by a middle-aged person or an old guy," Liu says. "For example, those blog posts on democracy, his general idea was — this is what our society is like and we can't change it. He seems to have lost his edge." Some critics think Han has been pressured by the Communist Party to tone down his writing. Han denies it and suggests that no matter what he writes, he's bound to be criticized. To make himself clear, he switches for the first and only time from Mandarin to English. "Sometimes I write some article, maybe the article is not good for the Chinese government," Han says. "They say I took money from America. Sometimes, I write some article that says the government is right. They say I take money from the government. So in China, lots of people think somebody [who does] something had to take money." In China's increasingly open public debate almost no one is spared. People are freer to question authority and challenge each other — especially major figures like Han Han.